Posted byTrefor Davies Tuesday, 16 August, 2016 Tuesday, 16 August, 2016 Leave a comment on Why do we bother using the Post Office? Last Thursday I posted my passport at the Post Office in Peel, IoM where I am on holiday. I wanted it to get to Richard Irving safely so I paid for it to go Special Delivery, guaranteed to get there before 1pm, the next day ie Friday. Richard is taking it to the Chinese Embassy to sort out visas. When I spoke to Rich yesterday it hadn’t arrived. It did arrive later that day. I wasn’t impressed so I went back to the Post Office to get my money back. To do this I now need to fill in a form and hand it in with my receipt. I have filled in said form. It’s a lot of hassle for £6.45 but I’m doing it as a point of principle. Now whenever I want to send something special delivery or signed for I always think of the Post Office first. They have the product and the brand. Next point. I ordered a printer cartridge from HP some time ago. Turns out they were out of stock so unimpressively gave me a delivery date some time in the future. That some time happened to be yesterday and I received a sms letting me know it was out for delivery. As you now know I am in the Isle of Man and unable to be there to accept the parcel. I forgot to reschedule it yesterday and received another text saying they, DPD were trying again today. This time I clicked on the link to rearrange delivery for when I am there. The link didn’t work (note HP/DPD) but I lifted the tracking number and went in via the DPD website. I have now arranged to pick the parcel up from a local depot. Job done. 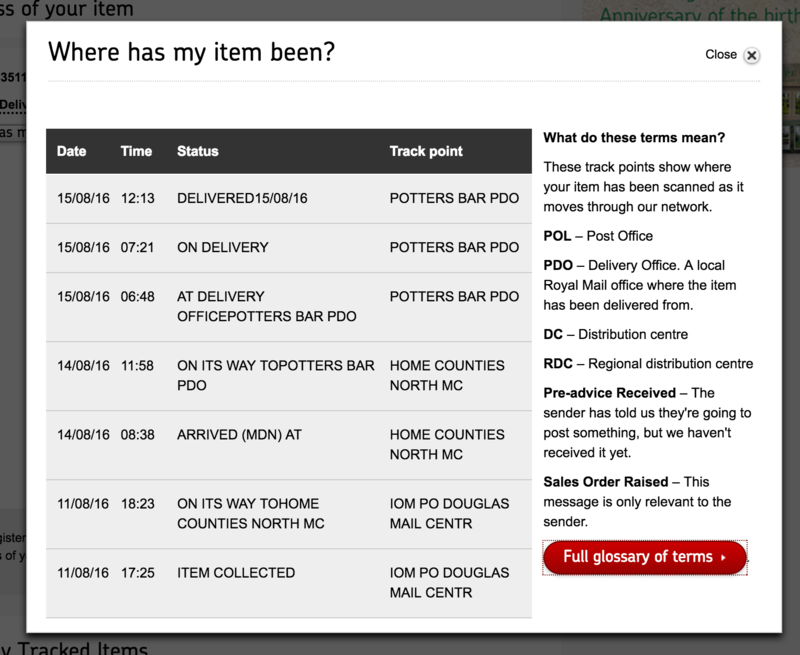 I am generally pretty impressed with DPD. I don’t think my experience with the Post Office matches this. It would have helped had I been able to make the claim online but no, I have to fill out paperwork and send it off. We need more high street options for Special Delivery services. I will investigate next time I want to send something.